With the constant risk of laptop damage and theft, it's essential to protect against disaster by keeping back-ups of all important data. While safeguarding your documents is the most logical step, Phoenix Recover Pro 6 (£30 inc. VAT) offers an even more comprehensive solution. By creating back-ups of the entire hard drive or specific files and folders, it's simple to reverse previously irreparable damage to your data by fully restoring it to a previous state. By creating and using these so-called data images, even the most basic user can protect their laptop. 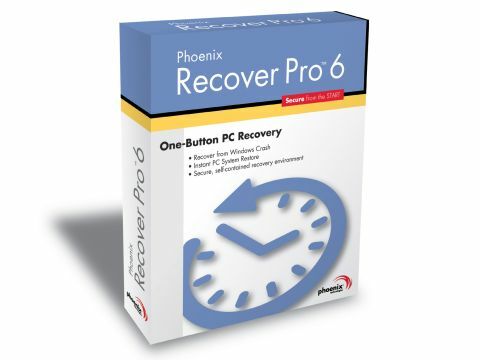 To ensure safety and ease-of-use, Recover Pro 6 keeps its operation simple and locks its back-ups away from prying eyes. When installed, the software automatically creates a new hidden partition on the hard drive, and keeps all back-ups safeguarded against tampering. Creating or restoring a data image is quick and easy to accomplish via a few simple mouse-clicks. A tabbed interface allows access to all back-up and restoration options, and most operations can be achieved in as little as three clicks. Further simplifying usability, running the first drive back-up creates a full drive image, while subsequent back-ups create incremental additions to the original data file. As more back-ups are created, the software automatically removes the older back-ups to clear space. In the event that the user wants to access a single data file or folder from an older back-up, but doesn't need to fully restore the drive to a previous state, it's no problem to open an old drive image as if it were a separate drive partition, and then quickly pull out the required data.